This assignment gives a brief about the HSBC bank process. In this report, we have improved the system process of the bank from AS IS process to TO BE process. We have analysed the TO BE process about how much efficient and simple to use it is, as compared to AS IS process. The diagram provides the information about the project and organizes the work of different team into manageable sections. 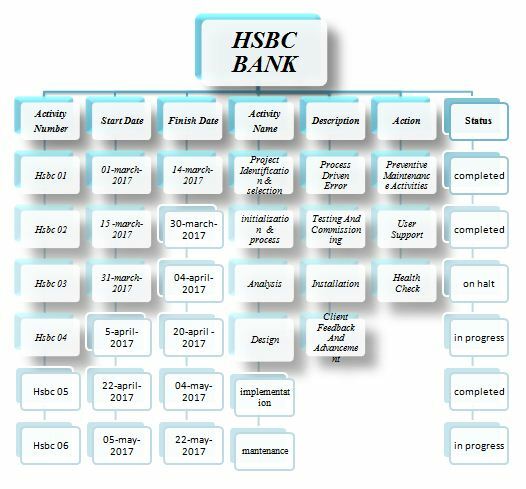 The WBS for the HSBC bank which contains activity name, start date, finish date, activity name, activity description, planned action, status and any other notes (Work Breakdown, n.d.). The impact that should be managed by the organisation when the new process in implemented on the organisation. Network Topology: The network topology is only an arrangement of a network that includes different nodes and connecting lines. The different levels of employee of the HSBC bank can easily demonstrated on the network topology. The employee will behaves, as the nodes in the network diagram and the connection will denoted by the lines (Tech Target, 2016). We recommended physical network for the HSBC organisation because by using the physical network the employee will easily communicated with each other, the communication gap in between the employee will decrease, and the efficiency of the organisation will increase. 1.Software Testing: It is the process to analysis a software to determine the difference in between the input we have given to the software and the output that we are expected. 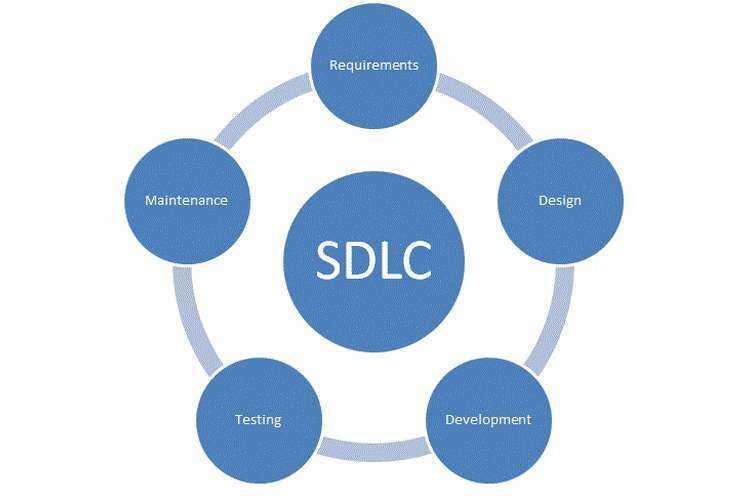 This testing is done during the software development process. In other words, we can say that it is the verification and validation process. 2.Static testing and dynamic testing: In static testing, there is no need to execute the program module. In this testing, we only review the code, walkthrough and inspection the coding. While in dynamic, testing the testing divided into the black box testing and white box testing which are the traditional way of testing (Khan, 2014). 3.White box testing: It is the type of the manual testing in which requirement of the advanced knowledge of the programmer needed. The various testing involved in white box testing are. 1.Testing various simulation: In this testing, the test runs automatically with the help of framework and the result of success and failure indicated by Boolean flag. 2.Testing all views: It is the extensive testing of all the views i.e. conceptual view, logical view, and physical view. 3.Testing of all data constraints: It includes the testing of the data like null values, handling comma, and large value size. 4.Black box testing: This is the automatic testing if the database in which the developer is not aware of the source code of the software. The black box testing generally involved. 1.I/O Validation: This also known as regression testing. This validates the incoming and outgoing data values. 2.Error Handling: This testing ensure that the empty strings are not present in the database. 3.Validating Table Structure: In validating table structure, it define the relationship in between the rows and column. 4.Testing of Store data: In this testing generally the testing of the data that are stored in table are tested. 5.Testing of modified data: When the tables updated, the table can generate the new errors, which can easily detected by the regression testing. For the organisation, we will prefer the black box testing because the testing is automatic and there is no need of any specific trained trainer to run the testing. The different types of groups in the bank need the training, which includes financial analysist, bank teller, loan officer and financial manager. The training and the topic that covered in the training. 1.Financial Analysist: The main work of the financial analysist is to advice the clients on business investment. They advise the client about the stock in which they can invest, give the brief about the pension plans. 2.Bank Teller: This is the first person that a customer will see when they enter in the bank. It solve all the doubt of the customer about their transaction and any other query. 3.Loan officer: They work with the business and commercial clients, look at the financial history of the clients, and help to fill out their forms. 4.Financial manager: The financial manager will manage and develop the financial reports. In addition, auditing of an organisation (Campbell, n.d.). The list of the topic, which would be cover on the new system development for the group of people that mentioned above. The organisation will use the AS IS process. As a part to improve the process we are considering the TO BE process. After the analysis of AS IS process, we concluded that the technique used in the AS IS process like simple flow-charting, UML are traditional, while the system changeover TO BE diagram is necessary because AS IS diagram not used for the root cause analysis. The organisation will need the process that make their task easy and simple, which can easily be handled by the TO BE process. The report contains details of the process, which should be implemented on the old process to improve the efficiency of the process as well as the organisation. Objective: The new process i.e. TO BE process contains a new process that should be implemented to the IS AS process to increase the efficiency of the overall process. Background: The new process is only the advanced version of the AS IS process. It contains several new grounds like the effective flow chat used in the TO BE process that not considered in the traditional process. Process Undertaken: The process that under taken is TO BE process in the place of the AS IS process that used in the HSBC bank. Scope: The TO BE process is very effective in several ways. The TO BE process is very effective, less time consuming; accuracy in result is high, store less storage, easy to handle i.e. no need of a very qualified person to run that process. Recommendation: So many big organisation is using the TO BE process. As the result, the efficiency of those organisations have increased, accuracy in there result also increased.